Speaking on the latest episode of The Joe Rogan Experience MMA Show, TJ Dillashaw divulged that he’s hoping to cut down to flyweight to challenge Cejudo for his title, rather than the other way around. He considers this the best possible option for his legacy at present, not just because a win would make him a two-division champion, but because Henry Cejudo is a former Olympic gold medalist in wrestling. “The Henry Cejudo thing entertains me so much because he’s a gold medalist,” TJ Dillashaw told Joe Rogan (transcript via MMA Fighting). “He wants to claim himself as the greatest combat athlete ever. 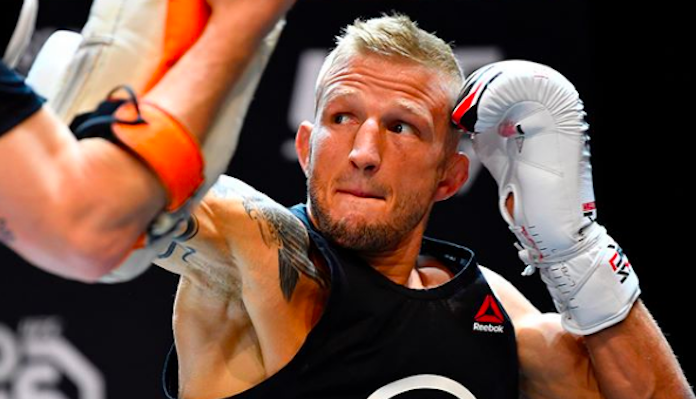 While TJ Dillashaw is interested in this fight, he says there’s no movement with respect to making it official just yet — though he seems to believe the UFC is interested. Dillashaw then reiterated that, for him, this fight would need to occur at flyweight, not bantamweight. That way there can be no excuses. Ideally that would be a unifying title fight and shut down 125. Yeah I agree think Marlon has earned his shot and should be next. Just wouldn't be surprised with Dillashaw's last PPV performing above expectations you could see the UFC trying to strike why the iron is hot with him. "Super-fights" should only be made when both champs have pretty much cleared out their divisions. TJ is several wins from that, Cejudo is a million miles away. I apologise for using the term super-fight for a fight between two midgets. Magic Marlon Moraes will whip this midget's ****, and then he'll actually defend his title. Unlike the rest of these assclowns. I also think Marlon would trash them both on the same night, he deserves a shot at the title. "While TJ Dillashaw is interested in this fight, he says there’s no movement with respect to making it official just yet — though he seems to believe the UFC is interested." Exactly who the Fug wants to watch that chit and I like Henry and TJ? I doubt the UFC would be so stoopid to tie up 2 divisions but wonders never cease. And sure as hell it aint no money fight. The preferred terms are Runty Rumbles, Tiny Tussles or Shrimpy Scuffles lol.